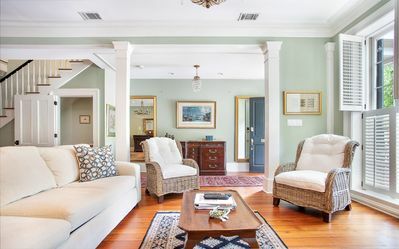 Built circa 1850, this elegant home has a rich and chronicled history. 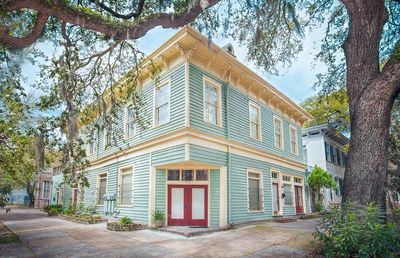 You’ll be staying directly across from the Green-Meldrim House, which was occupied by General Sherman during the Civil War and is where he penned his famous telegram to President Lincoln, presenting the city of Savannah as a Christmas present. 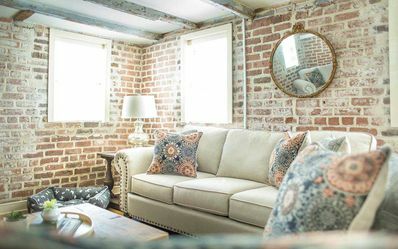 When combined with the Garden Apartment, the entire estate (Main House, Carriage House, and Garden Apartment) can accommodate up to 16 guests, making it perfect for events, weddings, and destination reunions. The second level entrance bring you into a grand entrance hall with spectacular inlaid wood floors and an elegant, curving staircase. To you left is the parlor, where you can look out at Madison Square and be transported through time. 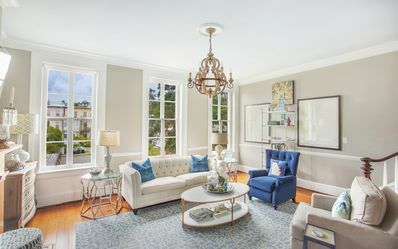 Step out onto your private balcony through the large windows, an architectural detail from a time when Savannahians were taxed by how many doors their home had. 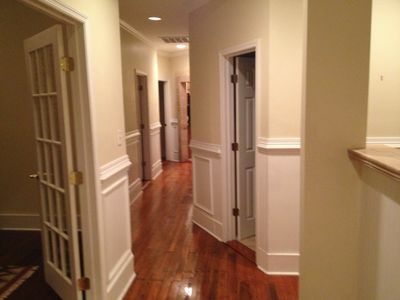 Pocket doors separate the parlor from the formal dining room. 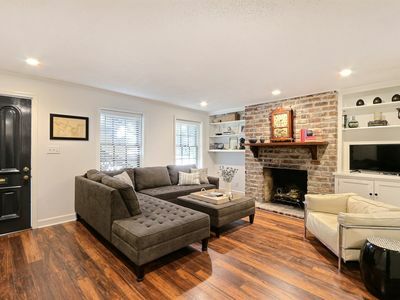 The wide farm table has seating for eight and convenient access to the kitchen and adjacent breakfast nook. The kitchen has double ovens, so you won’t run out of space when cooking for large groups! 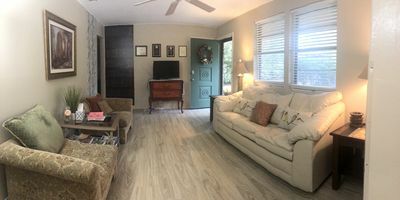 The third floor has three bedrooms and two bathrooms. At the top of the stairs in the beautiful Library Suite. 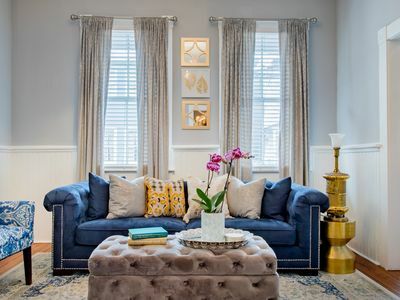 This private retreat has built-in bookcases, a decorative fireplace, and a full-sized couch, perfect for a rainy afternoon of relaxation and reading. 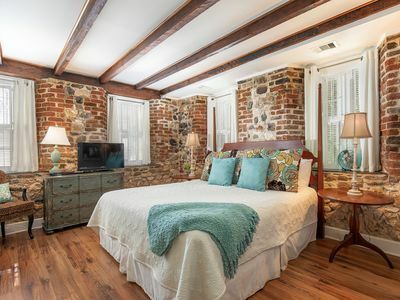 You’ll also have your own flat-screen TV and queen sized bed to drift off to sleep in. The en suite bath has a tub/shower combo and a dressing area with vanity and large windows letting in plenty of natural light. 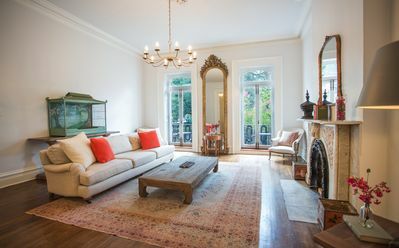 Overlooking Madison Square is a small but beautiful queen bedroom to the left, and a larger queen bedroom with a sitting area to the right. These two bedrooms share a large bathroom with a tub/shower combo and pedestal sink. 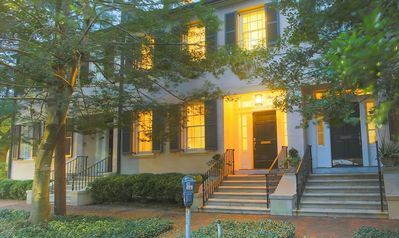 The fourth and final floor of this exquisite home is the Presidential Suite. The antique sconces flanking the white linens of the king sized bed give the feeling of a French loft. The European style ensuite bath has a large wooden vanity with gold accents, a glass shower and freestanding tub with views of the nearby church steeple. 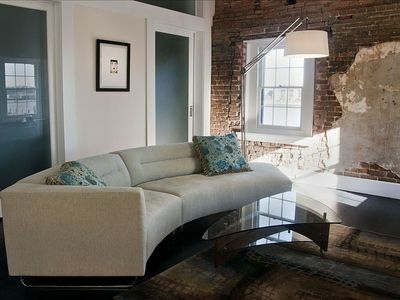 A chaise lounge, decorative fireplace and large, flat screen TV complete the room. 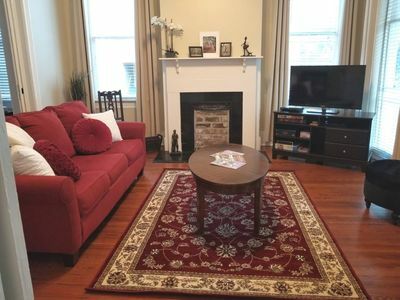 Large closets flank the entrance to the spacious sitting room, which has has its own sofa, chairs, and TV. Down the hall is a European style kitchen with all the essentials. A generous table and chairs makes this an ideal spot to enjoy a leisurely breakfast. 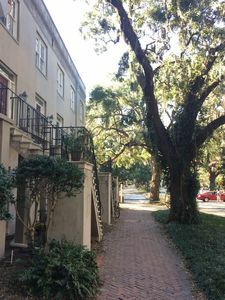 The small balcony off the kitchen overlooks the courtyards below, and the windows in the front of this suite provide an amazing view of the Episcopal church right across the square. Please note, we are unable to host bachelorette/bachelor parties or traveling singles in this home. 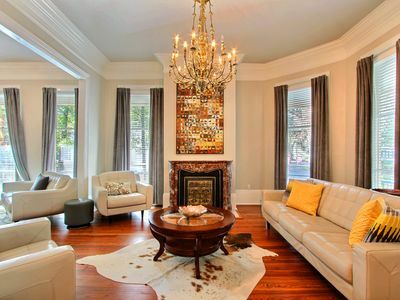 Stay with Lucky Savannah: 6 bedrooms, 4 baths, 2 kitchens & 2 living rooms! 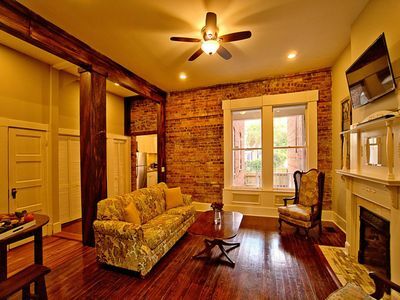 Radiant 1866 Home on Jones, the "Prettiest Street in the South." 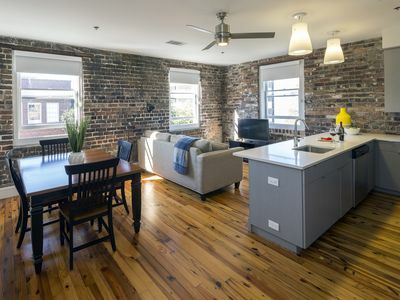 Chic Factor's Walk Loft Overlooking River St. & the Savannah River. 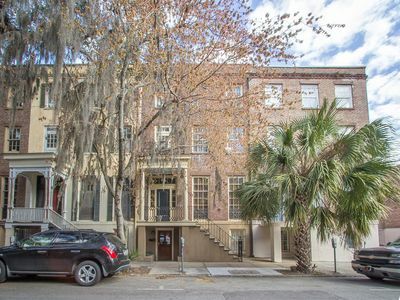 3BR/3BA Historic District Townhouse...walk to everything Savannah has to offer!! 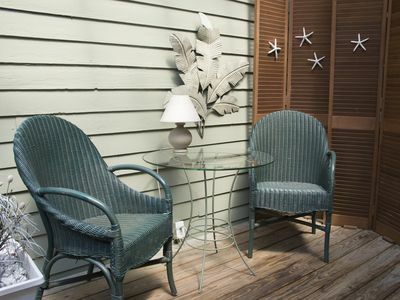 Savannah Rest Is A Quite Place To Relax with a huge backyard for events. 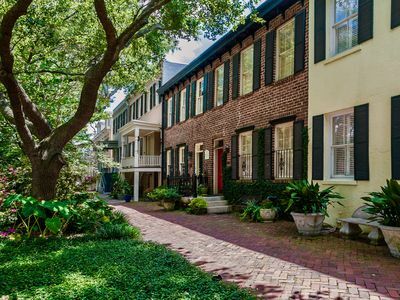 Stay with Lucky Savannah: Historic Garden Apartment, Pet Friendly w/ Parking!